Now I see why some people were unhappy about the mumbility. I guess at least it's the first time the site has fucked me. So you just want to get this off your chest or you have some actual data for us to look into? Just a question, I don't recall reading this anywhere... but do you get mumble bans if you get reported and leave a lobby early, even if you were in Mumble? This has happened to me recently twice... it sort of makes sense since you Do leave Mumble too but, if you're not playing anymore... kinda doesn't make sense. Edited by The Once and Future King, 22 December 2014 - 05:08 AM. Edited by happs, 23 December 2014 - 04:26 PM. Not sure what happened, but received a mumble ban for it. It's happened a few times in the past, as well.. which I usually just let expire. i just got mumble banned even though I was in mumble. I left the game early because we got rolled on the first round. It seems you cannot leave the game early if you are in a mumble lobby or it will lead to a mumble ban. i didn't care the first 2 times, i just played a non-mumble required lobby... but now it's starting to annoy. I was in the middle of a mumble required lobby a few minutes ago while in mumble and my computer crashed. I had to restart the computer and since then I am now banned once again from mumble required lobbies. LISTEN UP ALL: this is not a thread to pour your heart out and complain about this awefull system! It's meant to specifically indicate that parts of the system are broken, so I want Lobby numbers, dates and TF2C profiles! As for broken parts: I have concluded that Mumbility has a bug when it comes to being reported. I have also prepared a fix for that which is scheduled for deployment any time now. My mumbility number was raised to 9 after playing in this lobby even though I joined mumble. The lobby page said I joined mumble, but the mumbility was still raised. When I look at your active ban's lobby, it appears as if you were not in mumble, unmuted, for the threshold amount of time. It's simple, if it is a mumble required lobby, join, unumute, use mumble. Otherwise join non-mumble lobbies. The purpose of the ban is not to annoy you. Many serious players who use mumble for comms get annoyed by muted, deafened, or otherwise non-joining players during mumble required lobbies. Edited by UnnoTed, 28 December 2014 - 09:27 PM. 130.3 hrs last 2 weeks. I was in this game. I just played it, and I have witnesses that I was in mumble. I dont know why it said I wasn't in mumble, because i was clearly talking with everyone. it says I wasn't in the mumble even though I was. I was playing with some members of my 4v4 team, and we were in mumble the entire time. Edited by icoter, 30 December 2014 - 12:32 AM. 55.4 hrs last 2 weeks. 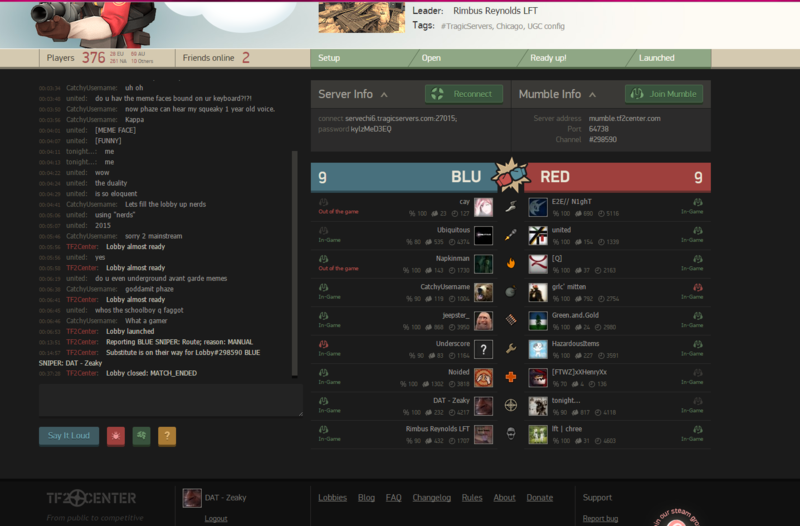 yeah I was in mumble with icoter during the lobby; he talked a pretty good amount i seem to recall. He was with me and another of our teammates, definitely was there. 32.3 hrs last 2 weeks. I was in mumble the entire time. I was a substitute for a sniper that was kicked earlier that game, so I think that maybe that sniper wasn't in mumble and thus the auto mumble system carried the ban onto me. http://i.gyazo.com/2...79137a325a2.png < In-Game and used Mumble as it is green. http://i.gyazo.com/1...7dba9ba2524.png Just the end screen as further evidence. I am kinda pissed this happened since now I have to wait even longer because a similar bug has happened before and it's really getting to me. I ALWAYS use mumble. 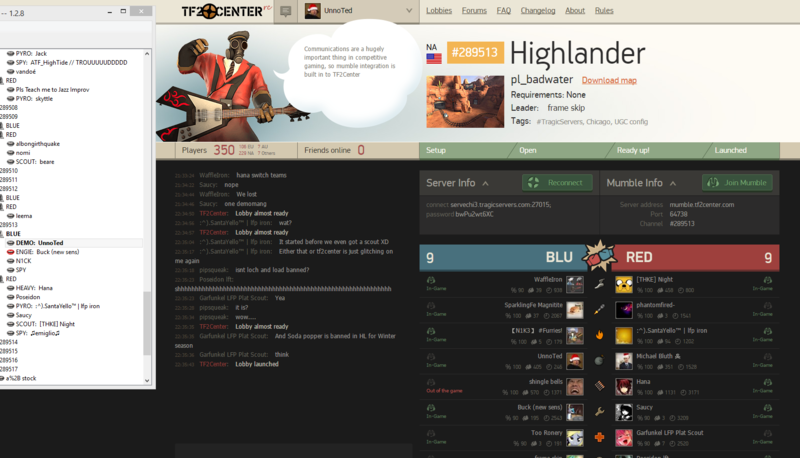 Here's what happened: TF2C lost connection to the Mumble server for 5 minutes, meaning that your Mumble attendance (and also of all other Lobbies taking place at that time) were not recorded. Therefor leading to an attendance % below a certain threshold; this get's corrected for non-subs since we have multiple references to see there's something wrong (missing samples). In your cases there is nothing we can do automagically. I have removed the Mumble cooldown. Dude, you really need to know when to shut up. This is a free service; you have no idea how many hours I have spent on this project. You have over 200 Lobbies played; the very least you could have done is donate. The IP on the site was 107.77.76.65; in Mumble you used 98.231.179.143. How do you expect us to match you? The IP on the site was 179.180.149.188; in Mumble you used 187.112.20.48. How do you expect us to match you? 31.5 hrs last 2 weeks. First off thank you for making this change, it was sorely needed and a good step toward fidelity in lobbies. Second, I've just been wrongfully given a lobby mumble ban. I really can't remember the last time I was in a lobby, mumble required or not, that I didn't join mumble for. I really see no point in lobbying without it. I even have the full achievement for not missing a single mumble in lobby for 8 months. My most recent game was a lakeside hl solly sub, if that helps at all. Can this ban be lifted? How long is it normally for? Mumble ban, was in the correct mumble the entire game. I don't use proxies if my IP changes slightly due to an internet hiccup that's out of my control entirely. Edited by Vortex, 11 January 2015 - 03:01 PM. The First screenshot shows a mumble required lobby, me in the lobby under the name Kieran, and the time and date in the bottom right. Edited by Piplup, 11 January 2015 - 03:14 PM.